This slice is to die for! I posted it on Instagram and Facebook and got a lot of requests for the recipe so I just had to share. It’s so easy to make, and is actually healthy for you, even though you feel a little bit naughty when eating it. I was pleasantly surprised by how fudgey and, well.. caramel-y the caramel layer was. It turned out perfectly! The best thing is the tiniest piece is so rich and sweet (but not an over-whelming type sweet) that you really don’t need much and it lasts forever! Put all ingredients in a food processor and whizz until combined. It will take a few minutes to come together, don’t despair! Start with 10 dates and add a couple extra if needed. I ended up using 12 and a half this time, as 10 wasn’t enough to make the mixture sticky. Once combined well, press firmly into a slice tin lined with baking paper. I used a 7″ x 7″ pan. 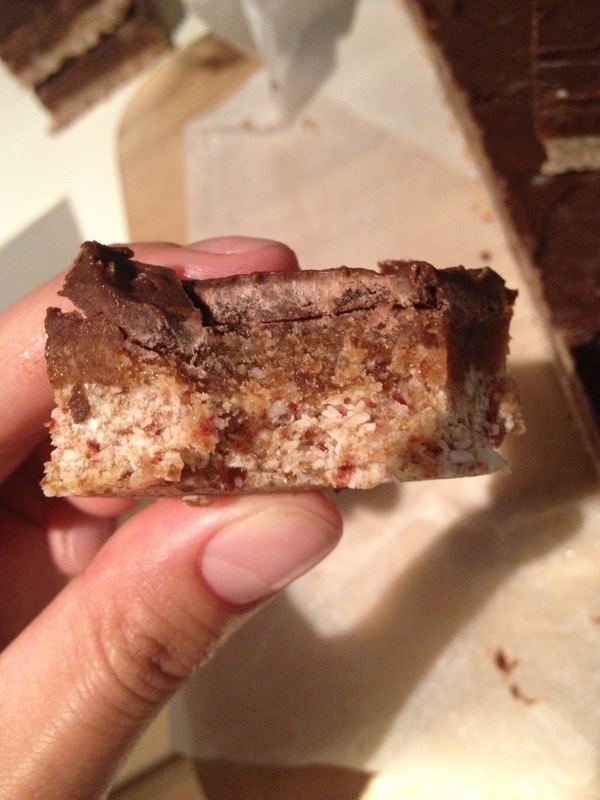 One of my favourite tricks is to use another piece of baking paper to press the mixture down. That way it won’t stick to your hands or be lifted by a spatula/spoon. Pop the tray into your freezer. Pulse the macadamias briefly. Add the rest of the ingredients and process until smooth. Be patient – it WILL become smooth! Remove the base from the freezer and spread it evenly on top. You can use a spatula, your fingers or another piece of baking paper to get an even coverage. Put it back in the freezer. Place all ingredients in your processor and whizz it until it’s smooth. 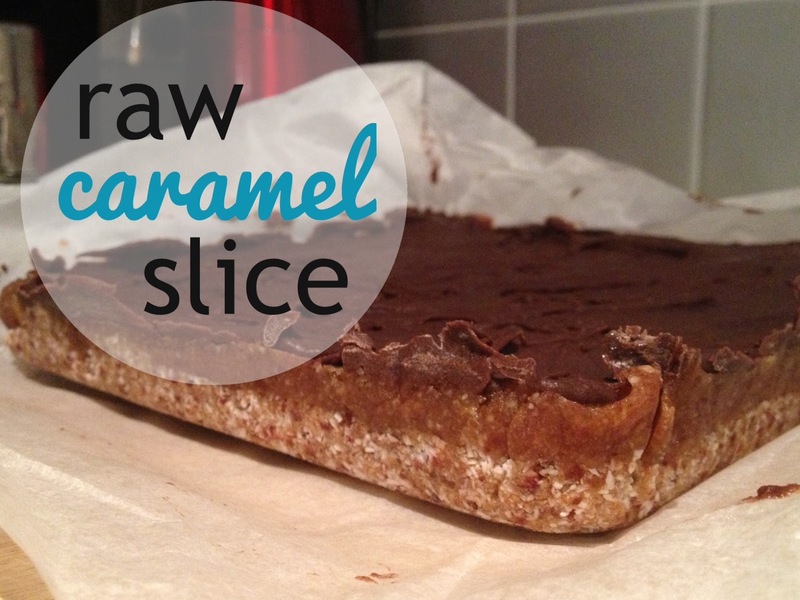 Pour evenly over the top of your caramel layer and again put it back in your freezer. After an hour or so, it should be set enough to slice up. You can keep this in the fridge or freezer but I leave mine in the freezer and take a piece out a couple minutes before eating – the consistency is just right! You could use cocoa instead of cacao but remember cacao is so much better for you! You could even add a tablespoon of it to the base if you like things chocolaty. Using a liquid sweetener such as agave instead of honey will make this dessert vegan. 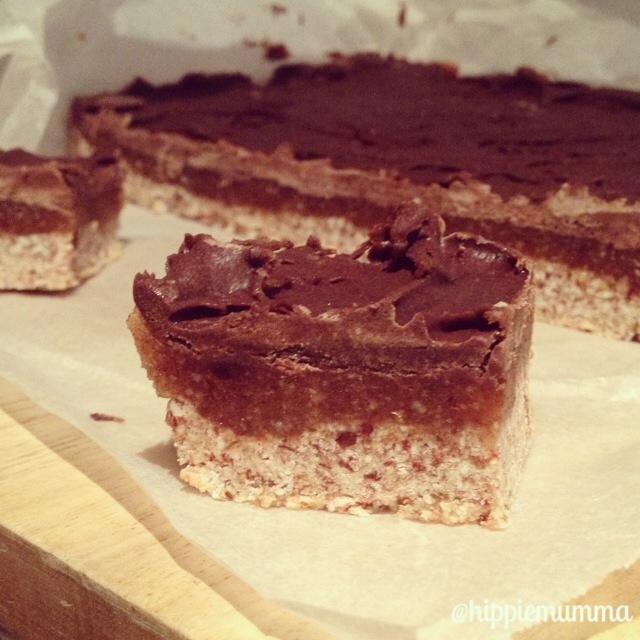 Leave me a comment if you give this recipe a go, I’d love to hear your feedback! This recipe isn’t my own. I’m not sure where it’s come from and who to credit, as my mum once emailed it to me and I’ve been making it every fortnight since! 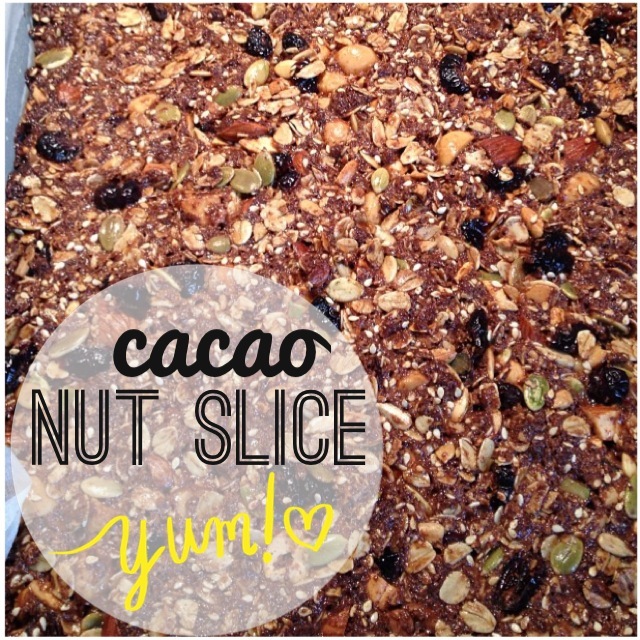 She still makes it regularly too as it’s such a healthy and delicious snack for at home or on the go. 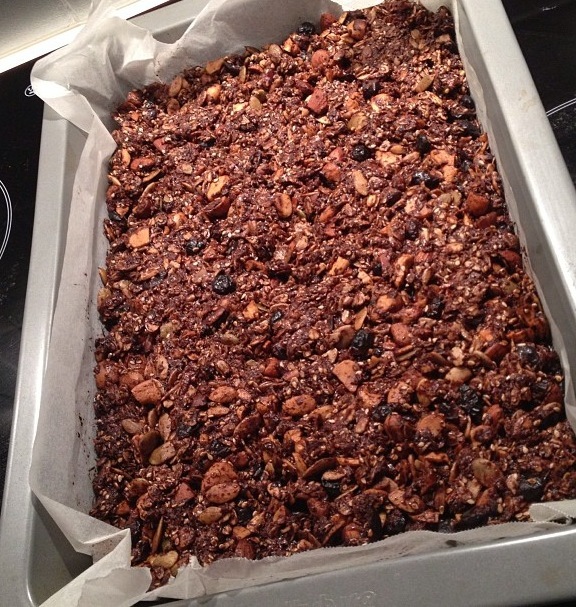 It’s kind of like a healthy crunchy muesli bar. It’s a staple snack in our house. DISCLAIMER! The recipe below contains sugar. I know, I know… smack me on the wrist 😉 I’ve eliminated so much sugar from my diet that I really don’t panic about having 1/2 cup of it in this whole recipe. The slice takes about 2 weeks to eat so if I wanted to justify it, I could get my maths cap on and work out the tiny amount of sugar I’m consuming each day by eating one piece. But, I don’t care. It’s full of healthy nuts and seeds, and the carob and cacao powder pack a punch of nutrients and essential vitamins and minerals too. I eat cacao every day, and you should too! So here is another way to get it into you. Line a lamington pan with baking paper. Combine all but the last 3 ingredients in a bowl. Place honey, sugar and butter in a medium saucepan and stir over heat until boiling. Simmer, and stir occasionally for 5 minutes. Pour it over the dry mix and combine well. Press mixture into the pan and bake at 180C for about 20 minutes or until browned. 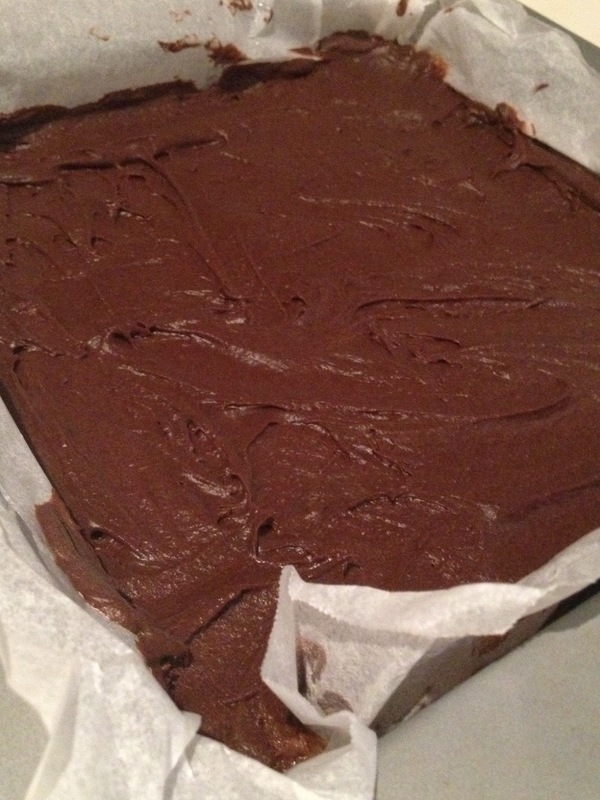 Let it cool in the pan before slicing into squares, rectangles, whatever shape you want! Store in an airtight container in your cupboard. You can use sultanas instead of cranberries if you’re on a budget. You could try using coconut sugar, but I’m yet to test this. I use Nuttelex instead of butter as I’m dairy free, and sometimes I use half Nuttelex and half coconut oil. I’m not game enough to try 125g of coconut oil, as I’m suspicious it may make the slice too sloppy and fall apart. If you try it, let me know! If you don’t have cacao and carob powder, you could use 3/4 cup of Milo as that’s what the original recipe calls for.